2013,Post-Apocalyptic America. An unnamed wanderer retrieves a Postman's uniform and undelivered bag of mail. 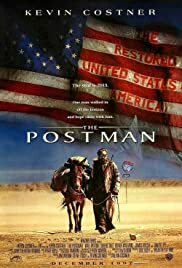 He decides to pose as a postman and deliver the mail to a nearby town, bluffing that the United States government has been reinstated and tricking the town into feeding him. However, he reluctantly becomes a symbol of hope to the townspeople there who begin to remember the world that once was and giving them the courage to stand up to a tyrannical warlord and his army. General Bethlehem: You see the reason you don't want to die for anything is because you have nothing to die for. That's the difference between you and me. You don't believe in anything. The Postman: I believe in the United States. 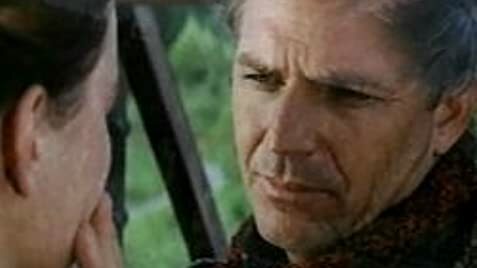 Q: Hasn't Kevin Costner played a drifter with no name in another post apocalyptic film? Q: How long since the apocalypse took place? Q: Are Kevin Costner's children in the film?